Heat grill. In small bowl, combine all butter ingredients; blend well. Place butter mixture on sheet of plastic wrap; shape into log. Wrap; refrigerate while preparing salsa and sea bass. In medium bowl, combine all relish ingredients; toss to mix well. Let stand while preparing sea bass. When ready to grill, sprinkle sea bass with salt and pepper. Place fish on gas grill over medium heat or on charcoal grill 4 to 6 inches from medium coals. Cook 15 to 17 minutes or until fish flakes easily with fork. Do not turn. 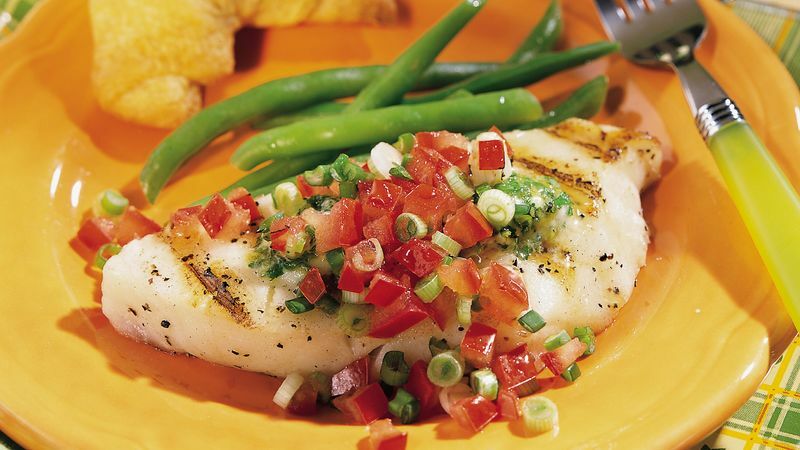 Serve sea bass with lime butter and tomato-onion relish. To broil sea bass, place on broiler pan; broil 4 to 6 inches from heat using times above as a guide.